College guides are a must for any teenager trying to choose the right school. Unfortunately, most guidebooks are vague, boring tomes written by administrators and journalists, instead of the real experts–the college students that actually go there. Students’ Guide to Colleges is different. Entirely student-written and edited, this invaluable resource cuts through the cant with comprehensive listings of the vital statistics and requirements for America’s top 100 schools accompanied by three totally honest, fresh, fun-to-read descriptions penned by attending undergrads from different walks of life. Want to know how big classes really are? How rigorous the academics get? Or how greek or granola, chill or up-tight, homogenous or diverse, gay or straight, a campus really is? 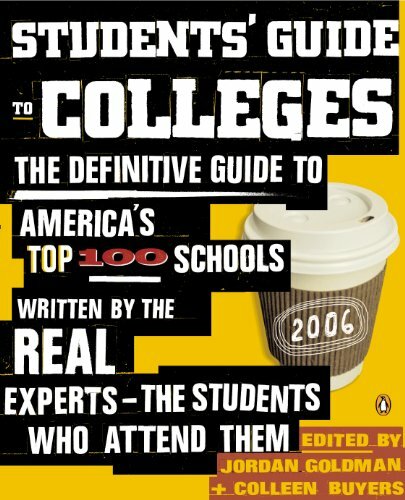 Lively, irreverent, and insightful, the Students’ Guide to Colleges is the only guidebook that offers multiple perspectives on each school and tells it like it is so that college applicants can make the best choice when deciding where they want to spend their college years.